OFFICIAL SCORPION OCP, PenCott BadLands and GreenZone now available. 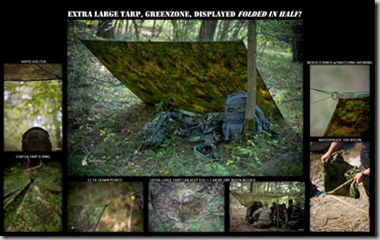 SELECT THE SIZE TARP THAT MEETS YOUR NEEDS! For Custom sizes and patterns please email sales@0241Tactical.com with your dimensions and pattern choice and we’ll get back to you with a quote. 0241Tactical Tarps are extremely useful and versatile. They are an excellent expedient cover for sheltering your gear or anything you want to protect from the elements or concealed from sight. 0241Tactical uses a single sheet of material to ensure the tarp’s waterproof qualities. Our tarps have reinforced one inch D Rings at the corners and along the sides to form attachment points for rope, allowing them to be tied down or suspended. Our tarps range in size from 90" X 60" through 270" x 180" which you plenty of room to cover you or your equipment.0241Tactical Tarps are made of USA produced material. 0241Tactical Basha Shelters 90" x 60" are made of a single sheet of material to ensure the ultimate in individual waterproof qualities. Our 90" x 60" Basha Shelters have 8 reinforced one inch D Rings at the corners and along the sides to form attachment points for rope, allowing them to be tied down or suspended. 0241Tactical Tarpaulins (120" x 90") provide excellent expedient cover for sheltering your camp or practically anything you want to protect from the elements or conceal from sight. 0241Tactical Tarpaulins are made of USA produced material. 0241Tactical uses two separate pieces of material, double stitched together, and the seam is sealed with a waterproof seam seal. Our Tarpaulins have 12 reinforced one inch D Rings at the corners and along the sides to form attachment points for rope, allowing them to be tied down or suspended. Measuring120" X 90", our Tarpaulins provide you plenty of room to cover your gear and cover yourself! 0241Tactical X-Large Tarps (180" X 90" ) provide excellent expedient cover for sheltering your camp or practically anything you want to protect from the elements or conceal from sight. 0241Tactical Tarpaulins are made of USA produced material. 0241Tactical uses two separate pieces of material, double stitched together, and the seam is sealed with a waterproof seam seal. Our Tarpaulins have 12 reinforced one inch D Rings at the corners, on top of (for vertical assistance if used as a shelter) and along the sides to form attachment points for rope, allowing them to be tied down or suspended. Our Tarpaulins are 180" X 90" giving you plenty of room to cover your gear and your campsite! Made from official USA Materials. Available in: Multicam, MARPAT DESERT, A-TACS AU, & A-TACS FG, PENCOTT BADLANDS & GREENZONE – INSTOCK!! Light weight and easily carried into the field. 8 , 12, and 16 Tie down points located throughout our Tarps. Excellent for camping and hiking.